Sometimes, you want to uninstall an old antivirus program and want to install a new antivirus program on your computer but you are unable to do so , because the interference caused by old antivirus install files (present in shared folder of your computer) , it can n't be removed by uninstalling antivirus alone . 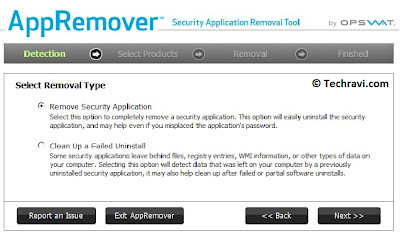 So, to remove this problem you can use this AppRemover program to uninstall your previous antivirus completely and install a new one successfully. Almost all antivirus programs are included in this list. This app is absolutely free to use and very small in size about 8.7 MB in size, also it is portable , so no need to install. You can download it from here.